Great news everyone, I am in the medias! It has nothing to do with my food blog, but my work as a scientific researcher. Ever since I came back from my trip to Cuba, I have been keeping myself busy with new research projects, training the new student in my research group, and organizing cooking sessions. 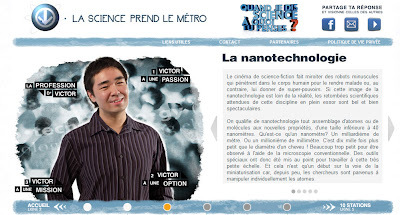 The past months, I have been doing extra work for La Science Prend le Métro (which translates to Science Takes The Subway), an organization which recruits students in the area of science to talk about their life story, passion and contribution to science. Each month, an article is written about that person in the Metro newspaper and a picture of them will appear in the big screens of the Montreal subway as you can see in the pictures below. Many students in high school are indecisive of their career path, so this organization has the goal to inspire and promote these students to go into science. When they sent the e-mail about this concept, I did not hesitate and accepted their offer. It was not only their incentive that pushes me to do it; I feel that each one of us has something to give to our society. It is like sharing my culinary knowledge with my cooking groups as I share my love of food with you. Here I share my love for science to high school students hopefully one day they love science as much as I do. Click on either pictures below. The first will lead you to the article on Metro newspaper and the second, about my life story, passion and contribution. Unfortunately, it is written in French. Do use Google Translate, it does pretty good job in translating. Courtesy to Emile Aragon, my photographer for all these pictures. Stock is a must when making soup, sauce and stew, it provides way more flavors to the dish than just adding water. I recently discovered that simply beer can also be used as a stock. 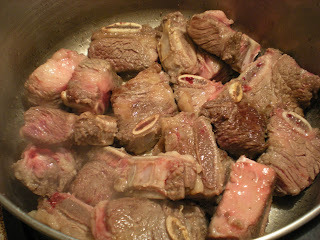 Here the short ribs are cooked in its fat along with aromatics. Afterwards, the ribs and vegetables are simmered in a pool of beer. The beer provides terrific flavor to these unctuous ribs. This will sure please your beer-loving friends. Don’t worry your friends won’t get drunk eating this stew as all the alcohol has evaporated during the cooking process. I'm not too sure which is the best beer for stew, I use the cheapest brown ale in store. 1. Heat a large pot over medium heat. Cook short ribs until brown on all sides, but still undercooked. Set aside. 2. In the same pot, add in onions, garlic, potatoes, and carrots. Cook onions until transparent, about 5 mins. 3. Bring back short ribs to the pot and pour in the beer. Season with salt and pepper. 4. Bring to a boil. Cover and simmer for 45 mins to 1 hour until the vegetables are tender and the meat falls off the bones. 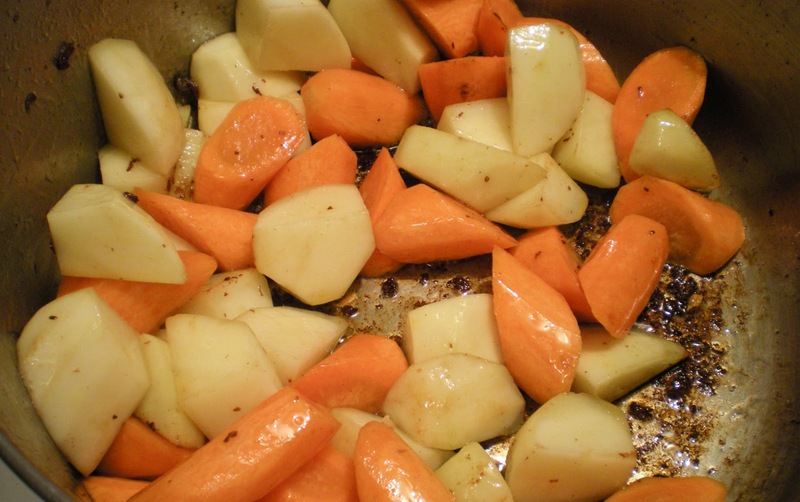 Remove the oil layer from stew. Serve. Congrates! How good news travels and reaches minds on the subway too. Well done on your advancing research project. Also, this recipe looks like a perfect meal for dinner at mine. 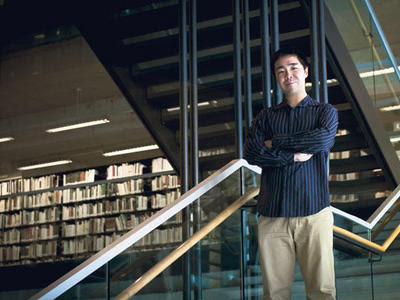 Hi Victor, it is so good to see you again at my blog. Thanks for your visit. Congrats on your new venture and I like your generosity in sharing your knowledge. I knew beer can be used as stock because my hubby used it to make some stew before. Your beef short rib looks delicious! Got to try this sometime. I am going to check out the link on your life story now.Thanks for sharing a bit of yourself with us. Congratulations! What a wonderful and beautiful dish. Like you with my tandoori, I've never made this before but would love to try it! I'll be trying this soon. Thanks, Victor! Wow! A big kudos to you! I love that you are reaching out to kids to give science a try. Best wishes on that venture. Your short ribs sound so inviting. I am definitely up for some of these. Congrats on the great coverage. As a teacher, I am so pleased to see you inspiring young people to excel in science. We desperately need more people like you. The stew looks excellent. It is cold and rainy here today, so I could really use a bowl. Kudos on the the wonderful story. What a wonderful project! You had me at short ribs; I'm having a love affair with them this winter. Yours look wonderful. I'll have to try that beer braise. The stew looks amazing! So comforting and delicious. Nicely done. Congratulations on your project! Your stew looks fantastic! Perfect comfort food! wow Victor, you look cool on TV! Congratulations! The stew sounds marvelous with beer. I know I would love it. This stew looks delicious too! I haven't had a stew for ages...! this is really easy to make but I will have to replace the beef with lamb as we at home don't eat beef. Congratulations, Victor. Anything we can do to encourage an interest in science will be all to the good. We need young minds in this arena! Congratulations, Victor! I wish you every success in your research. The stew looks really good with the beer. I've always wanted to try cooking with beer, but did not quite make it yet! Thanks for sharing! Félicitations!You have an intersting life ahead and you are such a good cook. Thank you for sharing this original stew recipe. How cool! Wish you all the best in your research. The stew looks delish. Love short ribs. Very comforting. Enjoy your Sunday. congratulations for inspiring the students who study science. 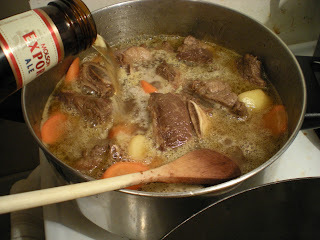 As getting job in pure science become very hard nowadays.Beer stew with braised beef short ribs looks delicious. I think alcohol imparts lot of flavors to meat. Hi Victor, Congratulations on this well deserved recognition by the media. It's such a worthy endeavour that you have undertaken, trying to create interest in science studies. 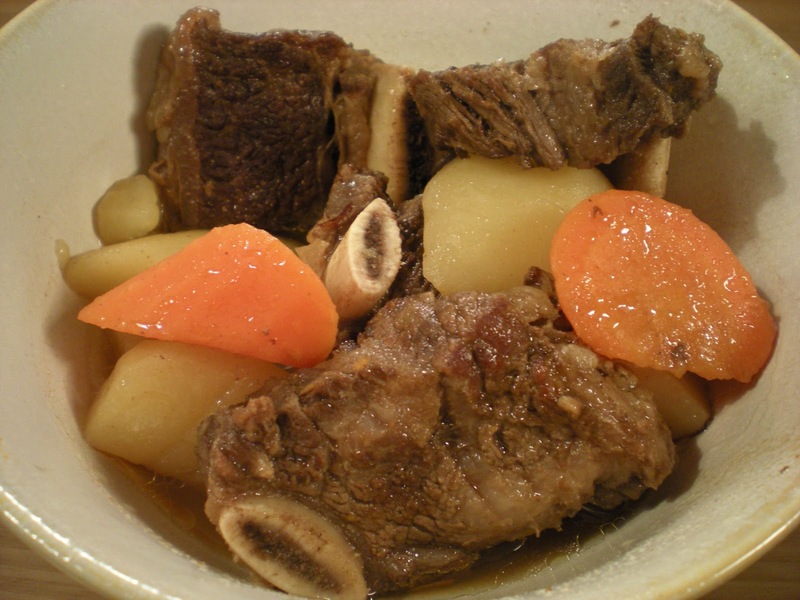 The short rib stew is perfect meal for cold and cloudy weather we've been having. Bon Apetit! this recipe is very tempting and tasting! Great job for the La Science Prend le Métro! You look fantastic on the screen! What a lovely stew! Yummy! Thank you for stopping by my blog Victor.I hope you try the curry and like it.This stew looks wonderful.Congratulations for the screen feature. Congrats, that is awesome! The stew also looks delicious. You are such a busy person and still have time to share your delish recipes. Congrats on the coverage. That is so cool. I am loving this recipe and your blog. Now following. Thanks for stopping by. You made my day. hi victor, to get those ipads folded into our pockets, i think that's pretty cool!! think abt it how science and technology helps to make our lives easier and better! wish you succcess in your projects! Thanks Lena. I can tell that we are heading into this direction and rhe results seem promising. It might be in the market possibly in 5 years.